The Historical Archive of Contemporary Arts (ASAC) collects, catalogues, expands and evaluates the conservational and documentary assets of La Biennale di Venezia, gathered from 1895 to the present. It also promotes the circulation of documentary material produced by La Biennale. The ASAC directly promotes exhibitions and collaborates with the various sectors of Fondazione La Biennale in organising events. The promotion of the heritage is also carried out outside the Foundation, through the circulation of documents and works of art lent to Italian and foreign institutions. It comprehends the Historical Archive and the Library. 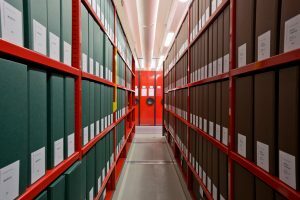 The Historical Archive of Contemporary Arts (ASAC) offers services of documentation, research and experimentation in the field of contemporary arts: visual arts, architecture, cinema, music, dance, and theatre. Since 2008 the Historical Archive has found its location in the spaces of the VEGA Scientific Park of Porto Marghera, appropriately set up to host archives and collections (Historical Fund, Posters, Music store, Film library, Media library, Artistic Fund, Collection of documents, Library, Periodicals) guaranteeing optimum microclimatic conditions for conservation and access to scholars for the consultation of materials. The Archive is distinguished by the heterogeneity of the materials present, including prints, photographs, cartoons, audiovisuals, scores, works of art, vinyl records, posters. Since 2009 the Library is an integral part of the Central Pavilion at the Giardini. 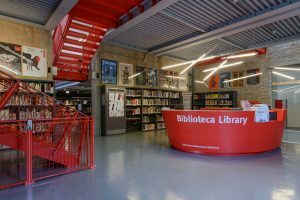 The Library specializes in contemporary art, with a special focus on documentation and deepening of the Foundation’s activities, preserving all the catalogs of La Biennale activities and collecting bibliographic material related to the disciplines of visual arts, architecture, cinema, dance, photography, music, theater. 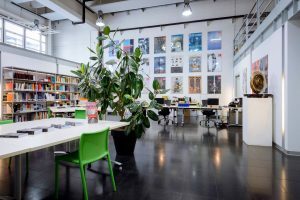 Thanks to its book heritage of more than 151,000 volumes and 3,000 periodicals, it is one of the leading libraries of contemporary art in Italy. A selection of works from the artistic fund are now on display in La Biennale headquarters at Ca‘ Giustinian. Library. Photo by Andrea Avezzù.